A grandmother was so disgusted by the filthy conditions and neglect on a hospital ward that she bathed and cared for the patients herself. 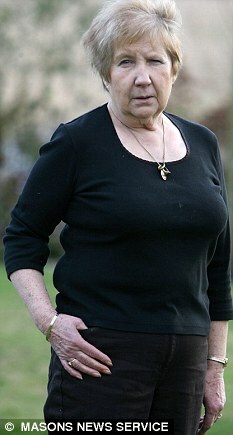 Janet Halsall, 74, was admitted to Hinchingbrooke Hospital in Huntingdon, Cambridgeshire, for three days to have a scan on her liver, when she was shocked to see staff repeatedly ignore pleas for help and leave fellow elderly patients to ‘fend for themselves’. The implied thinking in just these few statements by Obama is unbelievable. Obama is willing to say anything to get his plan accepted, and few in the media are giving the other side. He truly believes in his Socialist agenda. This is at the core of his being. He sat for 20 years and listened and loved speeches on Liberation Theology, which is at the core of Obama’s beliefs. It comes out in every speech he makes. In Liberation Theology a free market economy, capitalism and profits are bad, poor people government run economy and forced redistribution of wealth are good. “Companies take premiums”? NO! Companies’ trade limited resources (product) for money from willing buyers. It is Governments who TAKE taxes from those who are not always willing participants. This kind of language has been mostly out of the public eye since the mid 1980’s, so we have forgotten this language that Obama uses so regularly. Obama thinks he is right, he is very powerful, and is totally supported by the Press and the Congress. The “public plan” will be ultimately be subsidized by you the US tax payer. This will make it impossible for a private plan to compete if the Government will tax or print money to subsidize the public plan. The gross inefficiencies of bureaucratic government are staggering. The public plan will also limit health costs by limiting the supply of healthcare. This does not mean that we do not need to fix some areas of Healthcare. We need to solve the problem of the person that loses their job and has a preexisting condition. However the Obama socialized medicine “public plan” is not the solution, it is the problem. The engine of the world is a motivated innovator, inventor, and thinker. Innovations help supply more goods that people want at less cost, which improves the living standard of all people, rich and poor. How are profits good? Profits motivate people who innovate. Insurance companies must compete (see list of 24 major ones in Wikipedia) with each other. That means that they must innovate by offering better service, lower prices, and pay claims fairly to stay in business. You can complain to your state insurance commissioner and the commissioner may sue the Health Insurance company if warranted or you can sue. Insurance companies must obey the laws and keep their customers happy or they go out of business. No one is forced to do business with any of the 24 major companies if they do not want to. But you will not be able to sue the Federal Government. Or think IRS audit, or getting the post office to not deliver the neighbors mail to you. Most of these 24 insurance companies are listed on a Stock Exchange and are known as “public companies”. If you have a 401K plan, you most likely own at least part of one of these companies. You the reader, the American public are the owners of these Health Companies that need “Discipline”. So, if they profit YOU profit. They are not faceless Capitalistic enterprises (bad guys) that take premiums. They are you. Obama wants to discipline you. If you do not like how they run their company you can invest in other companies. You have a choice. “Discipline Health Companies” – When has the government ever shown discipline? Amtrak is run by the government and loses Billions every year. Social Security is run by the government and is going broke. Medicaid is costing the US Tax Payers Billions of dollars. The US Post office loses money every year. Fannie May and Freddie Mac have cost the country over a Trillion Dollars. Would you ever hire a person with such a track record to “Discipline Health Companies”. Is there even one example of the government being efficient in anything? NO. How does the free market discipline companies? If they provide poor service, and a product that we are not willing to buy they, unless they improve, go out of business, and a new business arises who will provide a product (limited resource) at a price we are willing to pay. Profit is not bad, as Obama makes it out to be in so many speeches. Profit is the result of supplying a limited resource at a price that a customer is willing to pay. Profit motivates a company to innovate, and reduce costs, so they can increase their profit. At the same time other companies are doing the same thing. When one company does this better they grow faster. With no profits there is no motivation. “when families need it” – Sounds so good, “when families need it”. A world driven by “need” is a world that soon runs out of suppliers. Who is to say my “needs” are not greater than your “needs”. If it is up to you no doubt, when faced with a dire health need you would say your needs are greater. Who determines how much you really need. Do you need treatment for the common cold? Or have needs for a multitude of things that some people treat themselves and others run to the doctor or worse the emergency room. Who is to decide? What if your neighbor is more vocal then you are or knows the right government official and gets their “need” met, thus not leaving enough money for you? Right now many of us have a high deductible plan that we pay out of pocket for with the insurance plan picking up the high ticket items like cancer. This is because we are motivated by a price that we are willing to pay for a limited resource that could be used in other ways. Limiting the supply of Healthcare -- Yesterday, I was talking with a neighbor who is a successful, wealthy businessman. His father was a Doctor and a surgeon. Even 30 years ago his father recommended that it was becoming not worth the 18 years (includes 4 years of college) of education that it would cost his children to become doctors themselves. None of the kids went into medicine. Ask yourself, if you could become a brain surgeon would you spend the 20 year of study to become one? Would you become a general practice doctor (10 to 12 years) who on average makes less than an experienced fireman in Los Angeles, about $120,000? When you artificially limit a price the result is you get less of it. Why? Because suppliers have limited resources and it is their job to put them to use where it will benefit the owning public the best. In countries with Obama type health plans they limit the pay of doctors thus, highly skilled doctors are in short supply. The doctors can do other, better things with their life and time then be slaves for an ungrateful government. The result - worse healthcare. This is why thousands of Canadians come to the US every year and pay for treatment when if they had just waited long enough they could get it for free from a substandard doctor. And some think we do not need a NATIONAL DISCUSSION when it takes this much space to counter a few sentences of the Socialist philosophical blather that spews out of the White House every day. It is mind numbing. Call your Congressperson or Senator today. WASHINGTON (AP) - The No. 2 Republican in the House on Thursday compared President Barack Obama's plans for the auto industry to the policies of Russian Prime Minister Vladimir Putin, saying the White House has stripped credit holders of rights and given them to Democratic allies. "They said, 'Set aside the rule of law, let's strip secured creditors, bondholders, of their rights. Take them away outside of the bankruptcy process and give them to the political cronies and the auto workers' unions," Rep. Eric Cantor, R-Va., said in an interview with The Associated Press. Government run Amtrak - 39 Years of Subsidy. GM?? ?